This week’s surprisingly easy app is going to kill your boredom stone dead. Say hello to Dull! 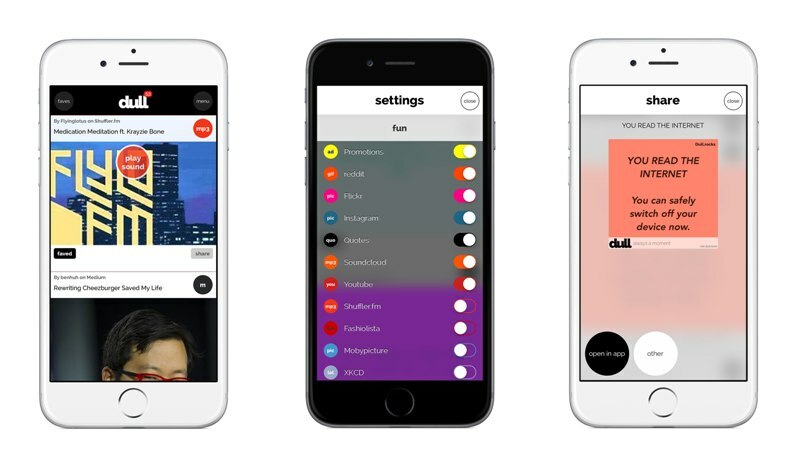 Dull presents a never-ending feed of trending content to your phone, meaning that you’ll never run out of stuff to read, watch or listen to. The content you receive is based on websites and services you subscribe to in the app, so you should – in theory – always receive stuff that interests you. A never-ending stream of content sounds daunting but Dull makes it easy to manage. If you want to read, watch or listen to the current content, simply tap the link. If the content doesn’t interest you, just swipe left and you’ll be served something else in an instant. It’s essentially an RSS reader mixed with Tinder. Basically, you’ll never run out of stuff to look at while you’re waiting for the bus and/or desperately trying to avoid getting reeled into a really boring conversation. Dull isn’t just an hyperactive RSS reader; it’s a game too. The app tracks how much time you’ve ‘wasted’, how many times you’ve swiped left and how often you’ve shared stuff with your friends. These stats then appear on a leaderboard, where the world’s greatest slackers face off in an epic battle to see who can waste the most time. Interestingly, the developers behind Dull claim its good for you too. Swiping left for an hour apparently burns 45 calories, although we imagine the developers had their tongues firmly lodged in their cheeks when they came up with that stat. Still, the app can be linked with Apple’s Health app, so there must be something in it. It’s fairly obvious: you’ll waste a ridiculous amount of time. Being told exactly how much time you’ve wasted is quite scary too. That said, used responsibly, Dull is a great little app for discovering new stuff. Oh, and it’s not out on Android yet either. Luckily, it will be soon. If you’re interested, you can sign up for Dull’s Android beta list on the Dull website. Has an app made your life easier recently? Share it with us in the comments. And don’t forget to check out our own surprisingly easy app, which let you scan the barcodes on your CDs, DVDs and Games for an instant price!